IARI Regional Station Pusa is situated in Samastipur district of Bihar in the U shaped southwestern lap of river Burhi Gandak at an altitude of 52.0 m and between 25.980 N and 85.670 E longitude. On July 5, 1784, East India Copmany acquired land at Pusa for Horse Breeding Stud Farm but after ninety years in 1874, Stud Farm was closed due to epidemic gland disease. In 1902 plan mooted for Animal Husbandry, Dairy Development, Educational Institution and Agricultural Institute at Pusa. On 26 December 1903, Government of India, took over all lands from Bengal Government and with the donation of 30,000 pounds by Mr. Hennry Phipps, a US citizen, Agricultural Research Institute (ARI) was established at Pusa. On 1st April 2004 foundation of Agricultural Research Institute was laid by Lord Curzon, the Viceroy and governor General of India. The main building was popularly called as Phipps laboratory or Naulakha. In 1905, five departments (Agriculture, Cattle Breeding, Chemistry, Economic Botany and Mycology) were started in the ARI. In 1907, Bacteriology unit added to ARI. The name of ARI changed to Imperial Institute of Agricultural Research in 1911 and in 1919, it was renamed as Imperial Agricultural Research Institute. On 15 January 1934 at 2.00 PM devastating earth quake damaged the main building of the institute i.e. Phipps Laboratory and on 29th July 1936, Institute was shifted to Delhi. 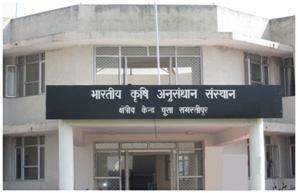 On 7th November 1936, new institute building was inaugurated at Delhi. A small unit called Botanical sub-station was left over at pusa, Bihar and in 1969, Botanical sub-station renamed as Regional Research Station and in 1975, Regional Research Station upgraded as IARI Regional Station, Pusa, Bihar. Development of high yielding varieties of wheat, maize and pigeon pea under resource constraint conditions in the north. Serve as a national centre for screening and development of wheat varieties resistant to foliar diseases which have become a major threat to wheat production in the country. Production of nucleas, breeder and IARI seed of IARI wheat, maize, pigeonpea and papaya varieties.